Of all the muscle-building challenges I’ve faced over the years, the calves proved to be my most formidable opponent. I’ve slogged through a dozen different calf training philosophies trying to get those bastards to grow. Eleven of those twelve proved unsuccessful. Since the calves get constant, low-level stimulation throughout the day from walking, I figured an opposite approach would work. So I first did calf raises with infrequent, high intensity training to failure. That didn’t work. Then I started experimenting with different tempo protocols where I’d have my athletes hold the stretch position for a few seconds to dissipate the stretch-shortening cycle (SSC). I kept the training frequency to twice per week. That didn’t work either. So I upped the frequency. But I was stubborn and figured that it was still a good idea to override the SSC. I assumed the high elastic component of the calf muscles would impede muscle growth. Nope, I was wrong. The best calf development I could find was owned by sprinters, volleyball players, and soccer players. None of these athletes did calf raises with a pause at the bottom. In fact, their training emphasized the stretch-shortening cycle. And none of them trained their calves only once per week either. Looking at the muscle actions their sport demands, I realized an important component that I was overlooking was DECELERATION, whether they were slowing down from a top speed sprint, landing from a spike, or quickly changing directions with a soccer ball. 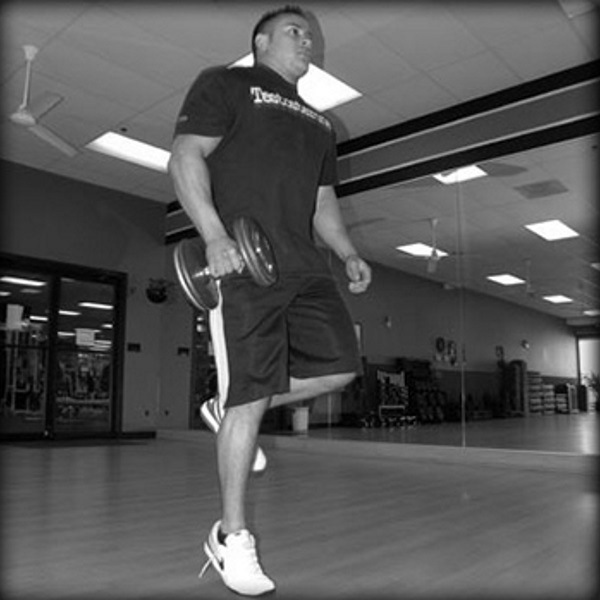 This is simply a single-leg hop while holding a dumbbell on the same side. If nothing else has really worked for your lagging calves, this will give you the results you’ve been looking for.